Food Urchin shares his magical Jeeves-based cocktail recipe, which he finishes with ginger granita for an added kick. 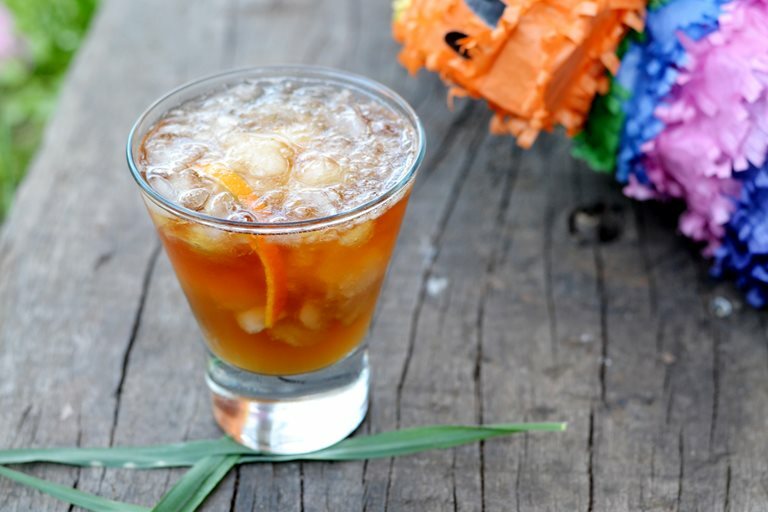 Make your own Ginger Magician Cocktail to unwind after a frantic day! All good cocktails have good names and if you look into the history of its conception, there will be a good story behind it too. The tale of The Ginger Magician has it roots back in a time when I was young, carefree and slightly reckless. I don’t really want to divulge the full details of the story but let’s just say that a display of flagrant dancing, atop a bar, in some dodgy nightclub led to swift ejection. The only defence I had at the time, was to tearfully shout and protest that I was indeed The Ginger Magician. Adding in a - “Don’t you know who I am?” - for good measure. Of course friends overheard all the clamour and like good friends do, they simply laughed. And from therein, that became my nickname. The Ginger Magician. I even have it inscribed on a plaque. Somewhere. Fast forward to present day and now I am a fully grown man, responsible adult and father; so those heady times are well and truly behind me. In fact, now that all that fabulous ginger hair has gone, I am not even sure I can truly honor that nickname these days. So when I got down to thinking about making a cocktail using Jeeves, a quintessentially British mixer that you would normally use for making a summer punch, I felt that an injection of danger and spirit should go into the mix. In memoriam. And of course it had to be called ‘The Ginger Magician’. There were a couple of incarnations along the way; such as Jeeves, rosewater and Midori, which was terrible and I was able to laugh back at one of my ‘friends’ for suggesting that one. Far too sweet. It was also tricky working out whether we should go down the highball route and make a tall, refreshing glass. Or whether to make something short, sturdy and stout. In the end the latter won and although fruity, there is hint of bitterness in Jeeves, when sampled straight (ahem). 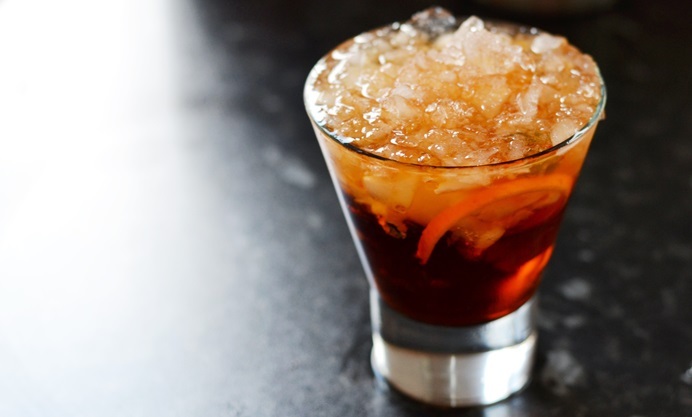 So the final result, with the introduction of gin and Campari, was not too far off a Negroni. Which really is an adult drink. Ginger still had to make its mark though. So I decided to make a light granita using the fiery stuff, to scoop into the tumbler right at the end. Like a sort of spicy wizards hat. And it works really well, in my humble opinion. Especially when supped at the end of a long, hot and frenetic day. I say that because the last time I had a GM was right at the end of our twins’ recent birthday party. Once they were in bed, I made one and sat in the garden exhausted, surveying the damage around me. The grass was strewn with toys, fallen chairs and paper plates. Plus a dismembered piñata that had been bashed to pieces by a thousand screaming children just a couple of hours before. It was my boy who delivered the fatal blow, to send packets of Haribo flying up into the air, to great cheers and applause. And as he turned to look at me, face beaming with a bright and rather naughty glint in his eye, I began to worry. Worrying that in the not so distant horizon, another ‘magician’ would soon be coming into view.